As I write this blog, I am on the plane headed to race the Puerto Rico Ironman70.3. I raced this event last year and looking forward to returning to the city and the venue. This was my first 70.3 last year, so I had quite a bit of nerves leading into the race since I was heading into some unknowns. I like repeating races I have completed in the past as it eases my race day nerves with being familiar with the race layout and what to expect on the course. This race is easy logistically because once I get to the hotel; swim start, transition and race finish are all within a quarter to half mile walk from my hotel room! Traveling without Caroline also allows me more time to blog…something that is tough to keep up with since she has become a toddler. Her energy at 8 and 9pm amaze us, especially because at that time Nate and I are so wiped out. She is usually at full tilt from the moment she wakes up until she goes to bed (with the exception of a possible nap). It has been so much fun watching her grow from two years to two and a half years old. Her vocabulary grows on a daily basis and her vivd imagination makes us smile. 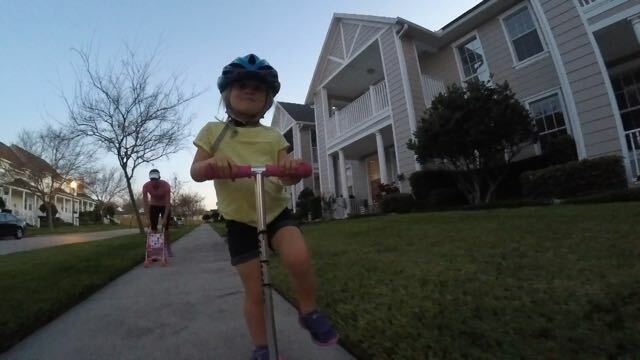 She is getting very fast on her scooter and it’s hard to keep up with her on the downhills! It seems like a whirlwind since the 2015 season ended and 2016 season started. Although I did take two weeks off training in November, it seems like I was focusing on 2016 before I knew it since I raced in Panama in January. Outside of training we have also been very busy with relocating for our future. We recently decided to buy a home in Eureka, MO (just outside of St. Louis) and be closer to family. We love training and living in Clermont, FL, but the reality is that Caroline will be starting Kindergarten in just over two years (hard to believe!!) and we wanted more of a permanent place for her verses packing up a couple of times year and moving locations! The past several years we escaped the Florida heat and headed up north for the summer racing season. Buying a home did not even cross our minds until just before Christmas. When we headed back to FL in January we began the process of upgrading our home in Florida and getting it ready to sell. Much of January and February, I did about 75 % of my training solo, since Nate was focused on installing a bathroom, painting, etc. I rode the CompuTrainer 2x week and usually made up my swim workouts during the warm-up of the swim! Overall, I was happy with my training progression, despite all the business going on outside of training. For several weeks when Nate was busy completing a project, I was with Caroline solo from around 3:30pm (when I picked her up from preschool until she went she went to bed around 9:30). I mentioned to him that I would rather have him help me with Caroline in the evenings verses have him train with me during the day! After a hard training day, I am wiped at night! For now the projects are finished and the house is listed on the market. Things have calmed down slightly, but still have some moving to do in a couple of months! Here is the project that Nate and his Dad did. I am really looking forward to this upcoming race season. I am focused on staying healthy (doing my best to avoid those two year old colds….although sometimes it is just unavoidable), and getting the most out of myself by training smarter and pushing hard at the right times. Good luck to everyone as the 2016 season is about to roll in….! I so enjoy following your career and remembering that ‘I knew you when’. Thanks Peggy! All the best to you and your family!